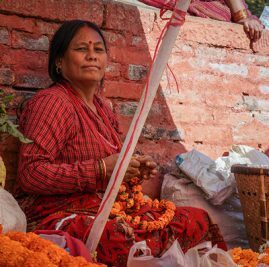 How last year's earthquake is giving Nepali Christians the chance to show God's love in tangible ways to the community around them. In April of 2015, the tiny country of Nepal was rocked with an earthquake that measured 8 on the Richter scale. The sudden earthquake killed more than 8,000 people and injured more than 21,000. Within minutes, hundreds of thousands were made homeless and entire villages were totally leveled. The earthquake completely devastated this very poor country, which was politically paralyzed to deal with a massive disaster like this. What happened first shocked the church, but in the end has transformed it. It is important to understand a little background. Nepal has experienced an awakening over the last four decades. For 200 years, it was a closed Hindu kingdom, where Christianity was illegal and counter-cultural. The gospel had already begun to take root in India, along the border. Nepalis all throughout the Himalaya region — including India and Bhutan — have a strong ethnic identity. In the early 1800s, William Carey was aware of this people group and began Bible translation for them. This led to the development of indigenous music that spoke to the heart of the people, but the spread of the gospel began slowly. Two Nepali Christians, Robert Karthak and Laxmi Prasad Neupane, climbed the Himalayan Mountains, crossed rivers, and walked 15 miles a day to visit inaccessible villages across this nation of 23.2 million people. Each time they stumbled across a village, they stopped to sing a few songs, share their testimony, and hand out gospel tracts to those who could read. They journeyed for 45 days, sleeping under the stars and wearing out five pairs of shoes, ever aware that they could be arrested by the police and jailed on charges of breaking the law and proselytizing. • It was an indigenous movement. It was Nepalis — not foreigners — who carried the gospel to the people. • It was a church of lay people – a natural movement that developed as new believers shared with family and friends. Streams of disciples were the result. • They rejected caste and other traditional Hindu divisions, which allowed the gospel to spread widely to all sectors of society. • The scriptures and the songs in the Nepali language brought the message to the heart of the people. Over the last several decades, the church grew from zero believers to more than one million, but the gospel was still considered an outside influence to society that caused trouble for the kingdom of Nepal. At the same time, Christians saw themselves as a minority that had no stake in the affairs of the country. The earthquake changed all of this. Ram Prasad Shrestha, a Nepali leader, noted that suddenly they saw the devastation that the earthquake brought, not only to themselves, but also to the communities around them. The government was paralyzed, while help from other countries could not pass easily through the red tape of government bureaucracy. The churches, however, although also needing help themselves, saw the opportunity to care for those in need around them. With the help of funds from WorldVenture and others helping in like manner, believers sprang into action. Work began with partners among the Tibetan Buddhist peoples of the north and the Nepali Hindus, the majority people. They had to first identify major disaster areas and then find ways to facilitate finding help for their needs. The first wave focused on emergency rescue and provision of immediate needs for food, shelter (mostly tents), and other needs. This continued for more than three months. When the rains came in June, the next focus became temporary shelter. Winter brought the cold and the need for more permanent shelter, blankets and the like. Today, there is so much work to be done, but many are now moving toward restoring their lives: rebuilding homes, planting crops, and returning to their livelihoods. Beyond all that, there is a new appreciation for the Christians. The loving of their neighbor, friends, and family members has been a natural, unforced opportunity to talk about the message of Christ. Churches once shunned by the Hindu majority are now places where they are welcomed. There are still homes and buildings to rebuild (including church buildings that were destroyed), orphans to be cared for, and families that are still hurting from the earthquake disaster. Please pray for WorldVenture partners who continue the heavy ministry load that is a result of all this, even in the middle of economic and political difficulties that the country continues to face. However, more than one year later, we can see the great things that God has done and pray that the church will continue to grow and mature. God is not finished here yet!